This section displays the palettes in the palette list of the selected layer. Drag these palettes into the Palette Overrides section to re-order them. You can load additional palettes in the palette list from either your project, by clicking on The Palette button, or your computer by clicking on the Browse button. • The Palette button allows you to load a palette contained within the project hierarchy (Environment, Job, Scene and Elements). • The Browse button allows you to load a palette located outside the project hierarchy, anywhere on your system or server. This section displays the colours swatches of the selected palette. Drag a swatch into the Colour-Overrides section to change its value or drag it into the Selected Colours section to render only that colour. This section forces the use of a particular palette or palette list order, during the composition process. You must drag palettes from the Palettes section to change their order. Animate Pro searches the palettes in the order that they appear in the palette list to find the colour values associated with the colour IDs of each image. To apply a different version of a colour palette, for example to switch from a day to a night palette, use the override section to change the order of colour palettes (you must be working with cloned palettes). 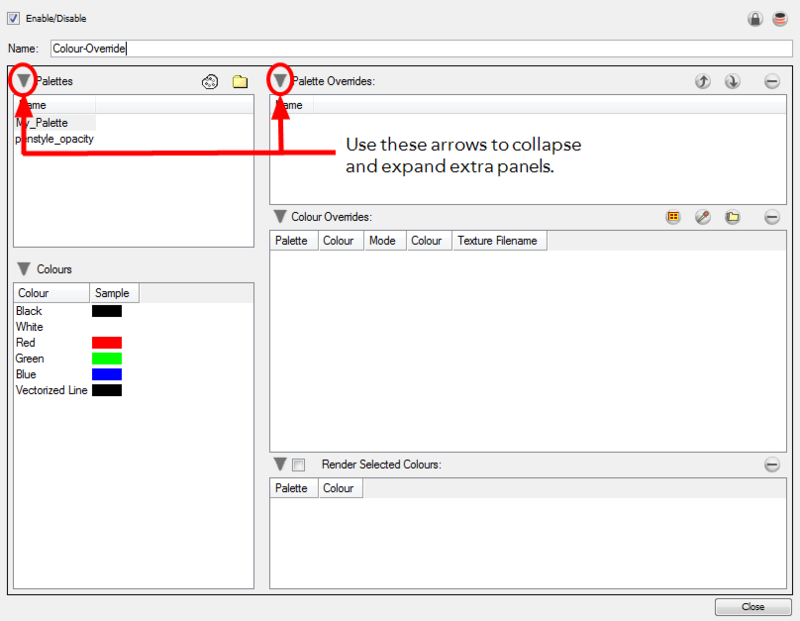 Drag a swatch from the Colours section to this section to override its value. You can also override a colour with a texture.